A recent poll of Ontario elementary teachers, for instance, found seven in 10 have personally experienced violence and witnessed violence against another staff person. This poll was conducted by the Elementary Teachers’ Federation of Ontario which represents 83,000 teachers, occasional teachers and education professionals employed in Ontario’s public elementary schools. 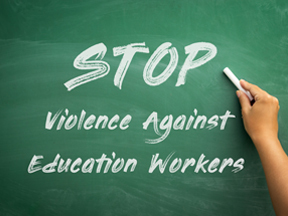 Thus the poll suggests more than 58,000 education workers are victims or have been exposed to violence at work. Almost 40 per cent of those polled also report suffering mental stress, physical injury or illness as a result of workplace violence.